Last year my family did the Whole 30 Challenge with our, then, three year old. I shared with you some tips for doing the Whole 30 Challenge with a toddler, and lately I’ve started getting some comments that I certainly did not expect from the post. What was probably one of the most rewarding experiences of the challenge for us is one of the things that some have begun to take issue with. I’ve been around blogging long enough to know that once one person takes an issue with what you write, they share it with their like-minded friends and you start getting waylaid with comments and emails. Of course, this can be a good thing as well. Sometimes people agree with what you say and share it with their like-minded friends. Both responses always sharpen me and take me deeper into the teaching of grace, and for that I’m thankful. But in this case, I was caught a bit off guard. I’ve run the gamut of emotions, but mostly I’ve spent a lot of time thinking and praying through my stance on using biblical words with my toddler. At this point, he knew what we could and could not eat. He got a little weary of the whole process. The new had worn off, and he started getting a little whiny for donuts and goldfish at church. He broke down and chose goldfish for snack at church. He told us about it at home during lunchtime. Then, we talked about what forgiveness and grace means. We told him that Mommy and Daddy struggle in the face of temptation too, and we even gave him examples from our own lives when we had given in to temptation. We told him that Mommy and Daddy need Jesus just like him, and even though we make foolish decisions, God is a merciful God who loves us very much. We recited John 3:16 together. It was a great opportunity to present the Gospel to Samuel in a way that he could understand. I believe for the first time, he truly understood sin and showed great sorrow over it. We told him that we forgave him for making a foolish choice, and explained that God forgives us too when we ask him to forgive us. We thanked him for telling us that he made a foolish choice, and we all said a sweet thank you to Jesus for grace and mercy. We prayed for Jesus to help change us from the inside out so we could make wise choices that bring Him glory. This moment made Whole 30 worth it all, in my opinion. The word “foolish” seems to be the stumbling block here. As I take a step back, I can certainly see why this would give pause or concern to some, but if we look past our initial gut reaction and personal prejudices with the word “foolish,” I think we can gain some clarity. Our son made a foolish choice when he chose the goldfish. Not because eating goldfish is a sin. Trust me, we have our fair share of goldfish from time to time. No, his choice was foolish because he knew the established rules and he disobeyed his mother and father knowingly and purposely. Foolish is a biblical word. As a family, we seek to use biblical words in our home. We certainly don’t get it right all the time, but it is our prayer that by using biblical words our children’s hearts (and OURS) will be convicted. Because when we use words from the Bible we are speaking the inspired word of God in our home. 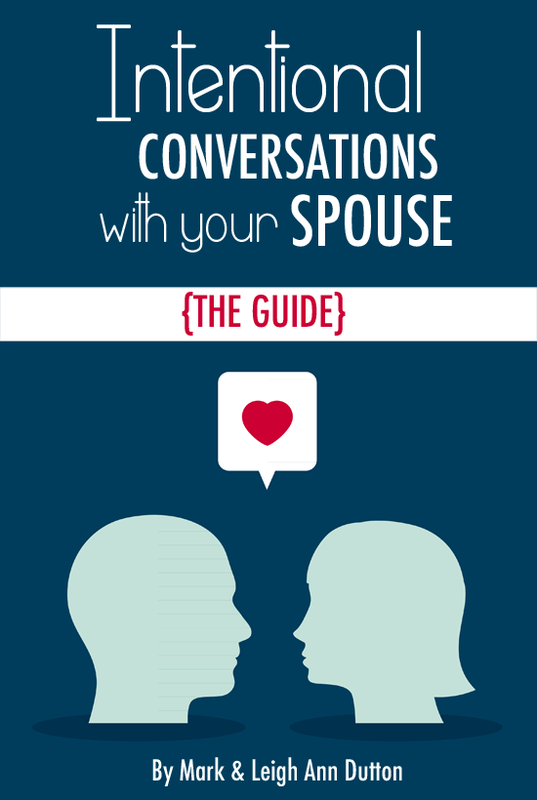 Using biblical words in our home gives us the opportunity to talk about God’s word with our children. In this case, we talked about foolish and wise choices. These weren’t terms that came as a surprise to our child. It wasn’t the first time he had heard these words used in this context. We talk about foolish and wise choices all throughout our days because if you’ve been a parent of a toddler or teenager for just a second, you know they give you a lot of opportunities to talk about foolish choices versus wise choices. By using these words with our children, we get really honest about what’s happening in our home. And when we read verses like Proverbs 12:15, “The way of a fool is right in his own eyes, but a wise man listens to advice,” or Proverbs 10:1, “A wise son makes a glad father, but a foolish son is sorrow to his mother,” our children begin to make the connections between their lives and the Bible. I can’t tell you how many times our son’s ears have perked up when he hears words like foolish and wise read aloud during family devotions. He knows these words, recognizes them and has examples from his own life that he can connect to the words he hears Daddy or Mommy read. He remembers when these words were used in his life, and will recall them in discussion around the table of eggs and burned toast. Our number one goal as parents is not to build happy, self-confident children. Our number one goal as parents is to make Jesus known in our home. For our children to understand how the Bible relates to their personal lives and for them to know that they, like their parents, are in great need of a Savior is our most important task. Our number one goal as parents is to equip a Christ-confident child with a working knowledge of the Bible so that he can find his eternal joy in the God of the Bible. In this case, our son was prepared for the decisions he would have to make in Sunday school class. I’ll admit, not all three year old children will get it, and each parent has to make the decision for their child when distinguishing between a foolish decision (sin) and a childish decision (not a sin). If this were the first week of the challenge, perhaps this would have unfolded differently, but it wasn’t. It was the third week, a week when all the rules were understood, and we all were tempted to toe the line of choosing something that was not good for us. This too, has a biblical word, and it’s called temptation, and we talked about this as well with our child throughout the challenge. Was this challenge hard? Yes, it most certainly was – for many reasons. But I wouldn’t trade this conversation with my son for a million goldfish! Because in the end, this isn’t about goldfish versus donuts. In the end, this is about training our minds to obey Christ (or Mommy and Daddy) so that in the day when neither choice is a good choice, we can stand alone if need be for the truth … for what is right and God glorifying. It is about an eternal mindset. It is about trusting in the only hope we have – Jesus Christ. Yes, even for our food choices. Even as little children. It’s not about instilling rules and regulations on our children, but introducing them time and time again to Jesus. We want to place their little hands into the hand of Jesus over and over again until hopefully one day they choose on their own to reach out and take His hand themselves. It’s true, my son was sad that day. Ashamed even. But he knew grace in a way he had never known it before. He knew forgiveness from Mommy and Daddy. Yes, he had to feel bad for a little while, but in the end, he heard about the hope that we have in Christ. 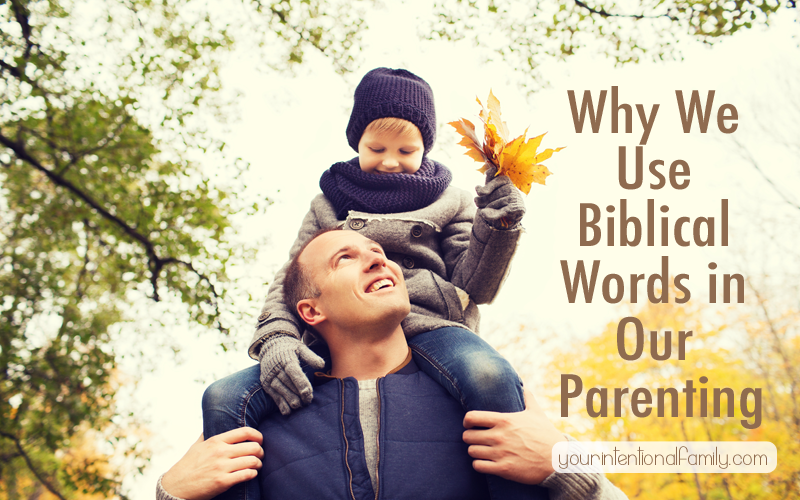 Our children need God’s word, in this case big words that even as adults we don’t like to hear. They need these words, and they need us to tell them the truth. The real truth. Not something watered down. We can tell them the truth because we know there is hope. We know there is more to it than feeling good about ourselves, about being “good people.” Being a good person isn’t enough. We need Jesus and that’s the bottom line for us. And we pray every day that our children will understand the teachings of their parents. We plow forward in faith trusting that God’s word will never return void. 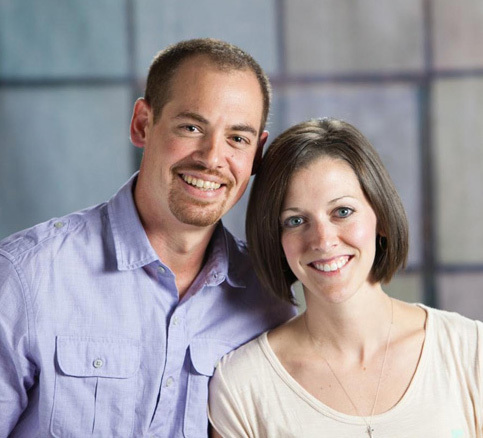 We have no idea if our children will come to saving faith, but that’s not the point. The point is that we will equip them in grace and in truth because we love Jesus and want to make Him known. What about you? 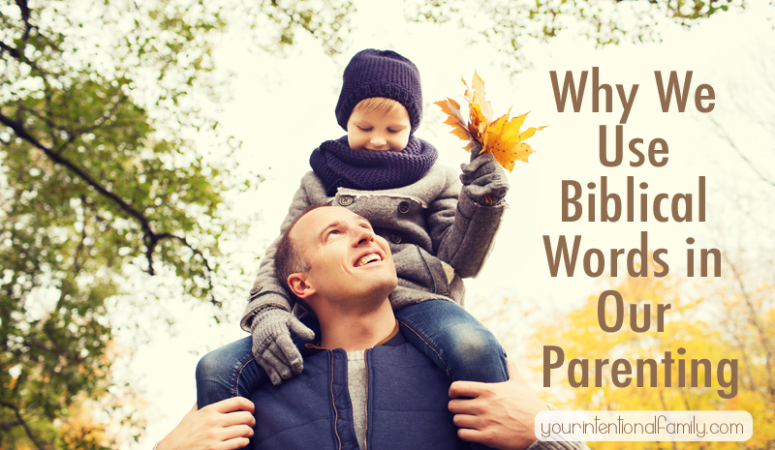 Do you use biblical words with your children or do you shy away from them?